Newley built the show, a sort of improv on the 7 Stages of Man, into a rather parochial British view of marriage--played in sketches, songs and pantomime--the latter trading on the then tremendous international vogue for Marcel Marceau, who'd refreshened the faded art of mime--before it became the ubiquitous streetcorner annoyance like Hare Krishna at airports. Using bits of Marceau, Chaplin and Sinatra, Newley melded a contemporary archetype into "Littlechap"--an Everyman at home in the age of England's Angry Young Men. Unlikeable in the contemporary fashion, he's a cad & a bounder, a faithless husband and only out for himself. Going into politics he represents the "Opportunistic Party." In the end, it's rather a depressing tale told by an unplesant character. Add clown makeup to that, and not a few shudder in repulsion. None of this would've had much impact, or lasting effect, however, without a musical score to prop it up. Written with composer/lyricst Leslie Bricusse, there's no clear evidence how much Newley contributed to the actual music--except to say Bricusse's many other compositions (without Newley), haven't that certain je ne sais quoi that is abundant in Newley/Bricusse scores. Stop the World has a majority of plot-driven songs or character-defining solos such as the quartet of takes Evie has on the same tune for the various women in Littlechap's life: English, German, Russian & American. (The movie replaces the Valkyrie-voiced frau with a Japanese Geisha--in deference to what?. . .German sensibilities?) The song itself is a lesser effort--a "list" song; which comes not once, but three more times after its first incarnation as "Typically English." Newley wisely gave himself all three breakout songs; the gospel-tinged "Gonna Build a Mountain," the reaching personal anthem, "Once in a Lifetime," and the show's signature, one of the biggest pop hits from Bway circa 1962, "What Kind of Fool Am I?" All three catnip to Sammy Davis, who quickly recorded them, and later played the show in revival. Among other Littlechaps was a pre-Cabaret Joel Grey--a Bway replacement. He later toured the country with the show, alongside the statuesque Julie Newmar--almost makes you want to see it. 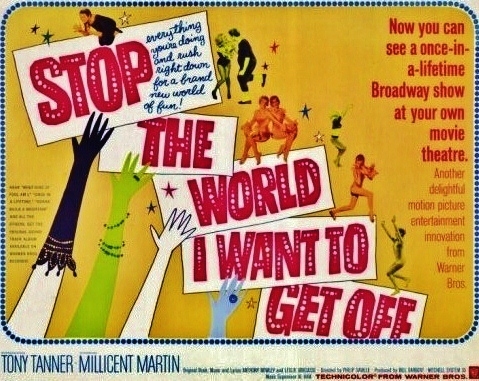 Bway's Evie was the British original, Anna Quayle, but the film chose Millicent Martin, another English comedienne who is the best thing in the movie--which is, unfortunately, nothing to brag about. Producer David Merrick, who was regularly shopping for product in Britain saw the show in tryout and snapped up the American rights before it even opened in London. 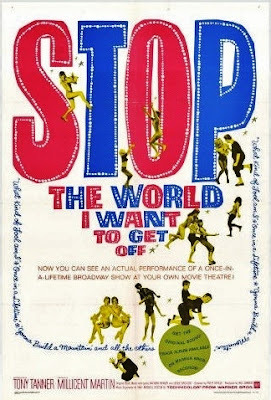 In the age of $400,000 musicals, Stop the World was a bargain $75,000 to mount--and recoup. Merrick boldly opened the show at the large Shubert Theater (Irma La Douce went for the smaller Pymouth) in October 1962, just prior to the Cuban Missile Crisis. It resonanted well with the Age of Anxiety and ran for over a year. Nonetheless, given its abstract nature, film rights weren't in high demand, and an indie producer, William Sargent Jr. made the pic cheaply for Warner Bros. Tho he had many Hlwd credits behind him, this was cinematographer Oswald Morris' first foray into musical film; a genre that would later earn him 3 Oscar nominations & a win. Neither Warners' scenic shop nor costume departments were much troubled by the production. Stop the World's main distinction was in heralding the British cultural invasion. London musicals rarely came to Bway; either they were too twee or parochial for American audiences. But the Brit's were developing their own modern tuners, and here was a good first example for Bway. Hot on its heels was another Merrick import, Lionel Bart's London blockbuster, Oliver!--which Merrick lavished on LA, SF, Detroit and Toronto before brining it in to NY. He kept the next Newley/Bricusse tuner on the road for 14 (mostly capacity) weeks, making a nice profit before a subsequent Bway run of only six months. It was a similar metaphoric unit set, this time even more goofy, a sort of musical Waiting for Godot--but with a smashing bright score that had nary a song that wasn't sensational; in my estimation one of the best Bway scores of the entire, fertile 1960s: The Roar of the Greasepaint--The Smell of the Crowd. But no matter how great the song list, ("A Wonderful Day Like Today," "Feeling Good," "The Joker," "Look at the Face," "Nothing Can Stop Me Now," to name just a few, and "Who Can I Turn To?" a ballad whose melodic magic continues to impress me), alas, a Beckett musical isn't going to get a sale in Hlwd. Warners' Stop the World opened at the Forum Theater in Times Square on May 11, 1966, and eked out a meagre 2 weeks before a stop-gap revival of Battle of the Bulge was rushed in before the next scheduled booking. At that moment in time Bway was flush with one of its last dominant cultural stands, with no less than 10 plays destined for the screen; including such Oscar bait as Lion in Winter, The Subject Was Roses, Wait Until Dark and Cactus Flower; as well as 8--eight!--musicals all headed for Hlwd; Hello, Dolly!, Funny Girl, Fiddler on the Roof, Half a Sixpence, Man of La Mancha, On a Clear Day, Sweet Charity and Mame, which would open only days later. The movie Roadshow engagements of My Fair Lady and The Sound of Music were both still going strong. With the Bway musical seemingly so firm in the firmament, STW, which seemed so new & fresh just four years earlier, now felt like a flimsy trifle. but now they have a daughter. Weird Hall of Fame: "Glorious Russian"